Here in central Kentucky it has been a very mild winter. 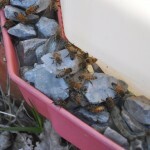 Many days were above 45°F, which meant bees flying and drinking from my bee waterer. On these warm days I observed lots of activity at the entrances of my hives, which has made me curious about what is going on inside. 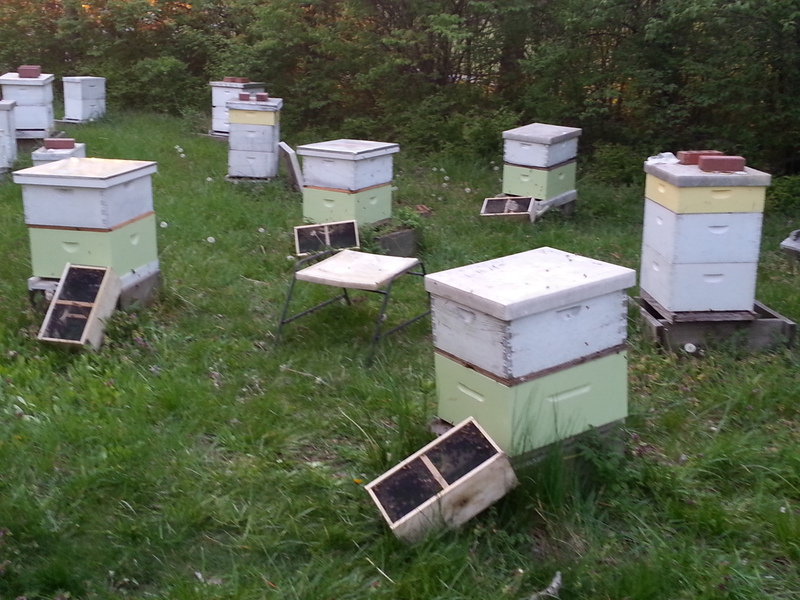 However, I have a policy of not opening hives and disturbing the clusters until we have consistent weather above 60°F. That time finally arrived this week as daytime temperatures climbed above 70°, and I took my first look inside. Keeping records – most important! Posted on April 22, 2016 | Comments Off on Keeping records – most important! 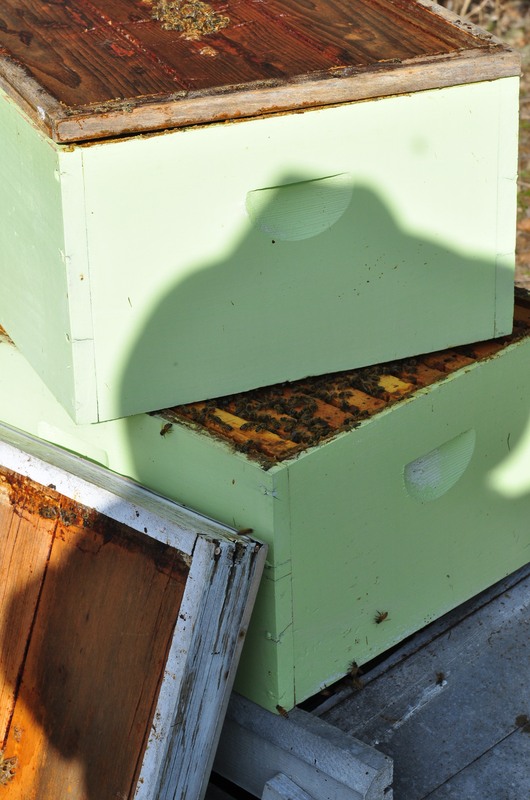 Keeping written records of what you observe when looking in your hives is extremely important. There are many ways to accomplish this. Some beekeepers write on the lids, others write notes and put them under the inner cover, and some have a code system of bricks on the lids. I prefer written records. I use a form which I photocopy, and keep in a ringed notebook. Each time I open a hive I use a fresh form, and place it over the form from the previous visit. Just as important, I review the previous record BEFORE I open a hive. Thus I know what I observed on the previous visit, and can tell if things look the same, better, or if there may be a problem that has developed. I note things like: how much brood is in the hive, if I saw the queen, number of frames covered with bees – hive strength, etc. I also make notes about what I need to do, such as adding honey supers, or replacing equipment – as in “replace a bad bottom board”. Feel free to download a PDF of my form, use it, or re-type it, and adapt it for your own needs. There is no wrong way to keep records. I will also share an example of a hive record example with notes from a hive visit. Sometimes I write a lot, more normally a lot of abbreviations. In a future post I will share more of the types of notes that I make, but wanted to let folks have the form now. Comments Off on Keeping records – most important! 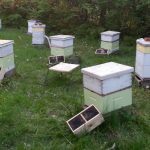 This is a follow-up to my post of April 13, 2016 which describes what new beekeepers should observe in new hives started from packages, or nucs. A week ago today, on April 15th, I installed five packages of bees. I looked at them today, and wish to share what I observed. These packages were purchased from Clay Guthrie, the manager of the Dadant & Sons branch in Frankfort, Kentucky (Guthrie’s Naturals), and originated in Georgia. After a number of years of both teaching beginning beekeeping classes and sitting in on classes taught by others, I have come to the conclusion that many of us on the teaching side are giving new and would be beekeepers a false impression about how easy it is to become a beekeeper. It’s not. What is easy is getting started: buying equipment, ordering bees, installing them in a new hive. These steps are not much more complicated than spending some money and following a checklist. What is difficult is becoming a successful beekeeper as opposed to someone who has a hive or two. Keep your goal in mind, and it is not to make honey – this year. In many parts of the country, including Kentucky, it is difficult to make honey the first year. If you do, it’s purely a bonus. 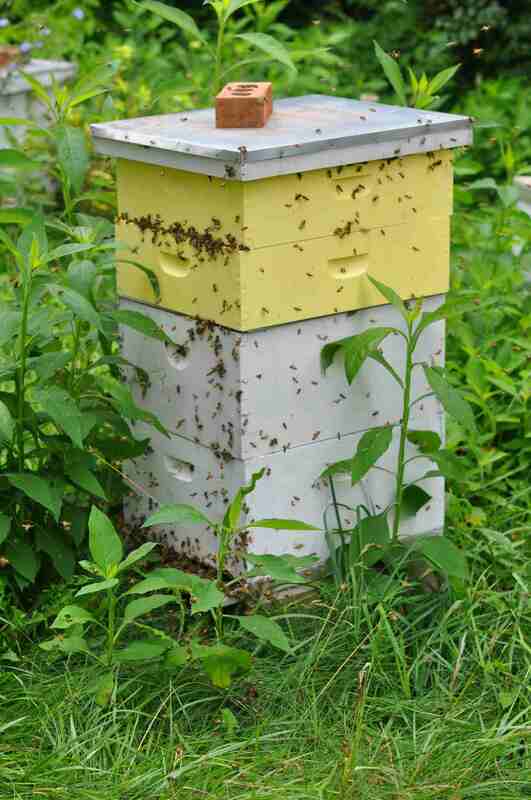 Your goal is to aid that package or nuc to become a full sized colony, one which will have a good chance of surviving the winter and making you honey the second year. In order to help it, you have to know what is going on inside the hive. You MUST do regular inspections, which means removing and examining frames, and making a written record of what you see. I suggest getting into your hives about once a week through early June. Here is a list of a few things to look for, and what to do when you see them. As we remove our honey crop from our hives it is time to start thinking about assisting our bees prepare for winter. We should start off with a good inspection of our hives. 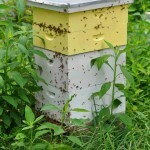 We do not need to look at every frame, but keep the following issues, and suggestions in mind as you look in your hives. Is your hive “Queen – right”? Concern: Queen issues, meaning queen not present – that she has disappeared. It’s nice to see the queen, but it’s not necessary in order to know that she is there. If you see eggs, larvae, or even capped brood. Then you can conclude the colony has a laying queen. You do not need to see the queen. Are you seeing “all stages” of brood? Comments Off on Robbing – honey bees as thieves! This is a question, and my reply, that I received as a result of my June 20th post regarding the registration of oxalic acid as a varroa mite control product. 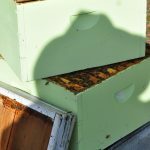 I appreciate the question, as I have been hearing a great amount of discussion among beekeepers on how to avoid purchasing a labeled product by mixing up the chemical themselves. Myself and others have been referred to Amazon.com to purchase oxalic acid, since the bee supply companies can’t sell it in most states yet. The problem is, CAS# 144-62-7, or Oxalic acid dihydrate (the crystalline form), not wood bleach, is marketed online as being 99% pure. So I was very surprised to read from you that the approved solution for bees is 3%. I don’t think very many people are aware of that. Any suggestions? I am sure that a number of U.S. beekeepers have been using oxalic acid for years, just as many have been using (and I’m certain some still do) homemade formulations of formic acid. Though purchasing and using non-labeled forms of either chemical for varroa mite control is illegal, the employees of state pesticide departments are very busy monitoring the application of legal pesticides, and it is rare for a beekeeper, especially a small scale beekeeper, to be cited for what we call off-label pesticide use. However, the odds of getting caught are not the only consideration. As many of you have heard, oxalic acid has been approved by the EPA for varroa mite control on honey bees. In the June issue of Bee Culture magazine, Jennifer Berry wrote an excellent article on the subject, which I suggest you read. See: http://www.beeculture.com/oxalic-acid-effective-easy-on-bees-but/. We are having a good nectar flow in my area, south of Lexington, Kentucky. I started putting honey supers on a month ago, which was later than most years. As in much of the Eastern U.S., we had a hard winter and late spring, my hives were also behind in April, but have caught up now. I’ve had some swarming, but have at least 1-2 full supers on all of my stronger hives, including those that swarmed. Like a lot of beekeepers, I had a couple of what Randy Oliver calls “dinks”, hives that for some reason, are slow at building up, but even these seems to be putting some nectar into supers now. We had a nice black locust bloom in my area, which started a couple of weeks ago, but storms last week knocked off most of the flowers. I am seeing a lot of white clover blooming now. We’ve had enough rain that blooming should continue. Drought can slow things down quickly. I was north of Lexington last Tuesday and saw a nice locust bloom there, the beekeepers told me it was just starting. This is a difference of about 50 miles, north – south. 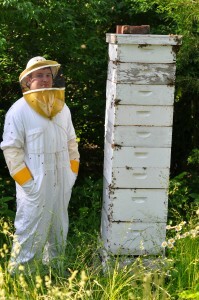 Here is a photo of my son standing next to one of our hives, taken on May 23rd. Five of those honey supers were full on that day and we added two more. These supers are 10 frame supers, but only have eight frames in each super. All of them were placed onto the hive with drawn comb. 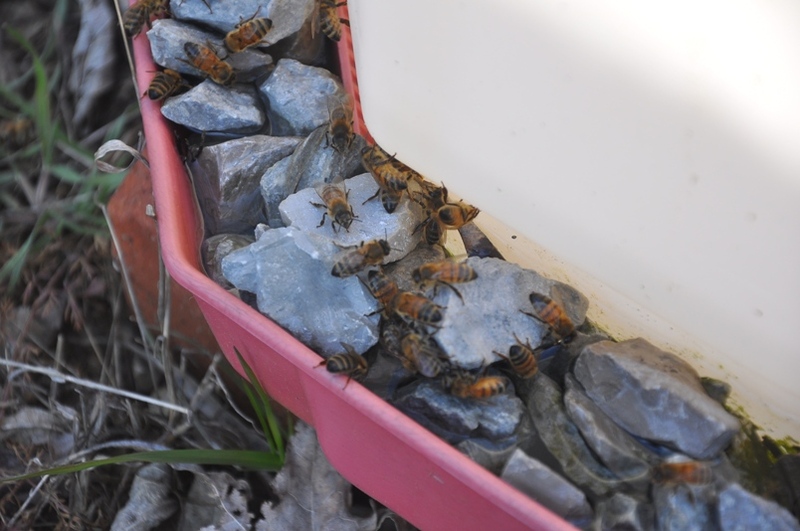 I’ll also comment that I did not feed any syrup last fall or spring, I did no spring manipulations – no reversing hive bodies or moving comb around. 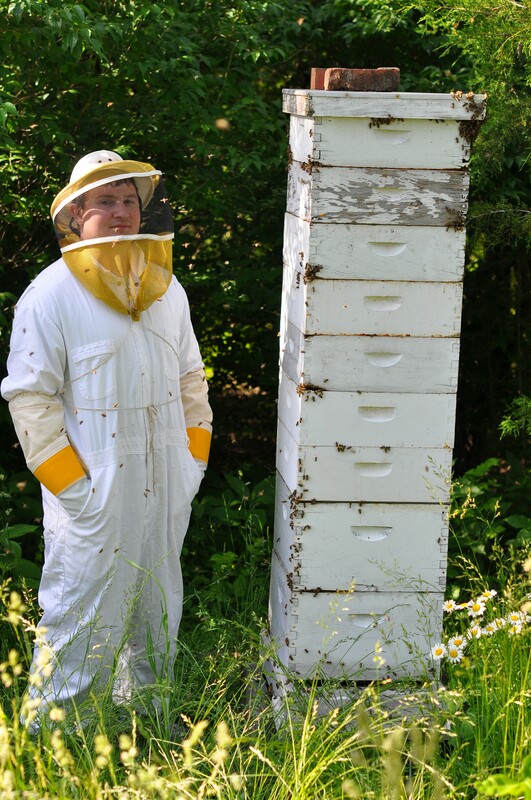 I did do a thorough check of my hives, both early in the spring and last fall. The inspection last fall included varroa mite monitoring. By far the most important management task that I undertook was treatment for varroa, this was done last fall, after monitoring. Comments Off on Early spring hive manipulations – be careful!